It’s a snow day for most here in Philadelphia, but comics still made it into readers’ hands and The X-Men’s Age of X started this week with Age of X: Alpha #1. The one-shot is an anthology book by series writer Mike Carey covering the history of five characters in this new timeline where the X-Men never existed and mutants are being hunted to extinction. The backstories are framed in the present with the mutants asking one another how they came to be at their refuge, Fortress X, as they wait for an imminent battle with their oppressors. Art for the framing scenes is by Micro Pierfrederici whose painted pages are full of lush colors and firelight throughout. As we transition through the campfire stories, we see that everyone seems to have lost everything they had in the world before coming together. Each character’s chapter in the book is covered by a different art team. All of them are well done, but none are particularly noteworthy to me. They share the common theme of mutant oppression taken too far, and do a nice job of bringing you up to speed on some of the series’ major players. I’ll be discussing some story details that may be considered spoilers in the next four paragraphs, so be warned. 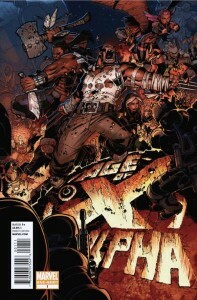 I’m familiar with Walta’s work from the X-Men: Smoke and Blood tie-in to the Curse of the Mutants vampire story. His work is very stylized and has an almost colored pencil quality that is rather unique. This story features a lot more action that’s also much cleaner than his work in Smoke and Blood. Arcade’s involvement was a little unexpected and really makes me wonder about the government power structure in the Age of X. We know Henry Peter Gyrich is running the mutant extermination campaign, the Human Coalition is referred to (and it could be the same make up as in Second Coming as Risman, Creed, Lang and the Trasks are all confirmed as members), and I wouldn’t be surprised to see President Norman Osborn if Arcade is the Governor of California. Using Scott Summers as an unwilling mutant executioner is sadistic and will clearly have turned him into someone we won’t recognize. This chapter features a more traditional modern comic style. The figures and faces reminded me at times of Humberto Ramos, but Barberi’s action is far less frenetic and looks great here. It’s probably my favorite chapter of the book and shows us a version of Sam Guthrie that is much closer to the one we know than the Scott Summers we see in the story that leads off the book. It’s Sam’s sister Paige (Husk) that’s really been changed. The slaughter of their family and all families capable of producing mutant children has made her bloodthirsty and her desire for vengeance is all that drives her. The dissension between the siblings over whether to kill their enemies should be interesting to see develop. Diaz and Milla’s art here is more conventional as well and may be the strongest art in the book. It reminds me of what I can only describe as an early Wildstorm house style. The story was more about Kavita Rao than Wolverine and that’s a good thing to me. Wolverine doesn’t really seem all that different here, but we learn that although Rao is working on a mutant cure in this universe as well, she has also been working as an informant to try to save mutants. The story may be the weakest of the book, but it could have interesting ramifications for Logan as he is used to metabolize and destroy the only working sample of Rao and Richard Palance’s (the mad geneticist, Pandemic, from one of Carey’s first X-Men stories) cure. There’s so much talk of Magneto throughout this book and a focus on what brought these mutants to him that he might be the one Rao enlists to save Logan from his own adamantium skeleton. Davidson’s art style here reminds me of the X-Factor work of Valentine DeLandro but with a more muted color palette and lots of shadows. It suits the story well as there is a lot of tension and a great payoff as we see Magneto appear in full and lead an intriguing group of mutants to safety. This story, more than any of the others, best illustrates the changes to the global mutant status quo. It features Toad, Forge, Cecila Reyes and Dust along with Magneto and Mystique if that is at all meaningful to you. If not, just understand that this is the first time those characters may have ever interacted on panel. The highlight here is that we also see the creation of Fortress X and it’s kind of awesome. Magneto escapes with his mutant refugees and most of the Manhatten skyline in tow which he uses to create their safe haven. I absolutely enjoyed this book and was happy to see that these were new stories not covered in all of the promotional materials, Historical Logs and Communiqués. Although I have to admit it lacked the excitement of something like X-Men: Second Coming #1 which hit the ground running and never looked back. Reading Mike Carey’s remarks at the back of the issue, it’s clear that this was meant to be a setup issue, but it’s still closer to a 3 out of 5 for me than a 5 (mostly because I’m dying to see the mystery of what this world is unfold). The issue included some fun appearances by characters that weren’t in the teaser images, namely Trance, Rockslide, Calisto, Masque, Chamber, Destiny, Mystique, the Ladies Mastermind and Toad (who calls them all “men and women of the x-gene,” likely to be the only reference to anyone here as X-Men). Read more about this series at our Age of X hub.